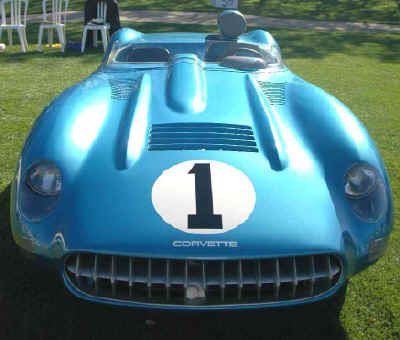 The Corvette SS (XP-64) began life as an experimental race car, and was unveiled to the public at the 12 Hours of Sebring endurance race on March 23, 1957. The SS was in training for Chevrolet’s debut at LeMans that year. The Sebring race was, in many ways, Chevrolet’s inauguration into modern racing. But the SS never finished the race, much to the dismay of the racing community. Soon after Sebring, the (AMA) Automobile Manufacturer’s Association banned manufacturer-sponsored racing, and the SS was relegated to test track duty. Custom-built by the Chevrolet Engineering Center under the direction of Zora Arkus-Duntov, the SS featured a lightweight magnesium alloy body, and a tubular frame in place of Corvette’s box-rail frame. Also included were a four-speed manual transmission, independent front and four-link rear suspension, the extensive use of aluminum, and a 283 cubic-inch fuel-injected V8 with 300-plus horsepower. The SS was extremely light, having a dry weight of 1,850 lbs. (approx. 950 lbs. less than the 1957 production Corvette). An SS chassis was restyled in 1959 by Bill Mitchell, then GM Vice President in charge of Styling, who turned it into the Stingray Racer. Years later, the Corvette SS name resurfaced on an engineering prototype built in 1990 – the Corvette ZR-1 SS. Now housed in the National Corvette Museum, the ’90s version of the SS was developed by Chevrolet engineering to test alternative lightweight materials such as magnesium, and their effects on performance. It featured a Dual-Overhead Cam version of the 5.7-liter V8, and produced 425 horsepower and 400 lbs.-ft. torque. At 2,750 lbs. (715 less than a 1990 production ZR-1), the ZR-1 SS maintained the tradition of light weight and high performance.